Welcome to the home of New Jersey Team Heat ACADEMIC and Sports Program now a part of the Lightning organization the largest and most successful program in the country (lightningbasketball.net). The program was founded in 2009 by Joe Owens(certified USA BASKETBALL Trainer) as a non-profit organization with the purpose of serving the urban community by helping young women excel on and off the court. Since its emergence Coach Owens along with his staff has offered tutoring programs, women's health awareness, and academic counseling to a number of young women in the Newark and surrounding community. The program has gained support and sponsorship from Jersey City Ford Motors, Dunkin Donuts, The Honorablel Mayor Ras Baraka, West ward Councilman Joseph McCullum, Applebees, Newark Collegiate High School, Royal Queens & Kings Social Club, Susan B. Komen Foundation, 107.5 WBLS, Streetz 106, and Next Level Basketball. 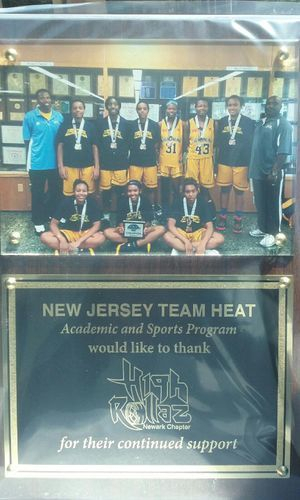 On the court NJ TEAM HEAT has participated in many tournaments in New York, Virginia, Chicago, North Carolina, California, Washington, Tennesse, Kentucky and Maryland just to name a few, with the hope of helping female athletes achieve there athletic goals through ACADEMICS!!!! !